Video produced by West TV at the May 20, 2017 Annual Meeting of the League of Women Voters Morgantown-Monongalia County. The 2017 Annual Meeting for the Morgantown-Monongalia County LWV will be held Saturday, May 20, at Ali Baba’s, 83 Hart Field Drive (Airport), from 11:30-2:30. 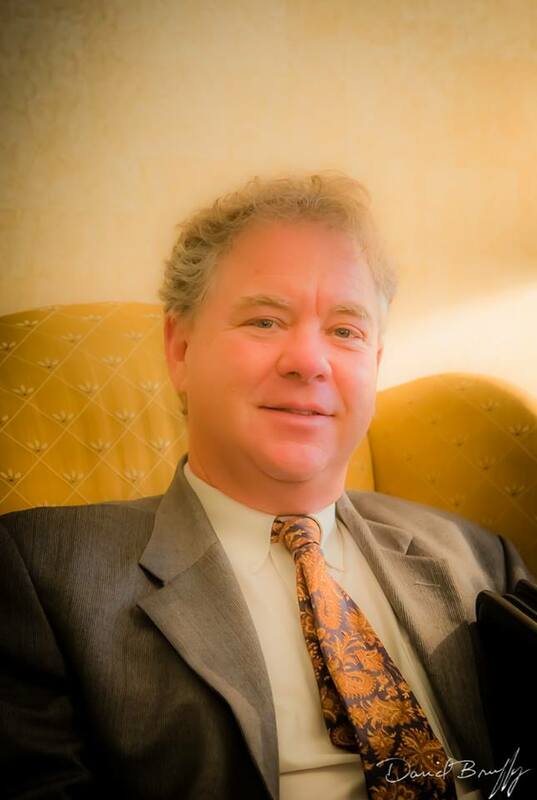 Our speaker will be Bill Austin, Executive Director for the Morgantown-Monongalia Metropolitan Planning Organization (MM-MPO). Before coming to Morgantown in June 2009, Bill Austin worked for four MPO’s in various capacities in Virginia, North Carolina, Florida and West Virginia. His transportation expertise led him to be a part of the consultant team for the Miami-Dade Expressway Authority, preparing traffic and revenue studies for proposed facilities in Florida. Our League has long been concerned about improving traffic conditions in Morgantown and the surrounding area, including pedestrian and cyclist safety. We are very pleased that Bill Austin will give us an overview of the MPO. We are interested in how the new transportation plan was developed, how the public was involved, major concerns identified in the plan, and what we can expect to see coming out of the plan. The business meeting will begin at 1:45, and will include adoption of the budget, the election of officers, and the proposed local program. The Board is very excited about the local program, and will spend time discussing ways members can participate in the league the coming year. Please plan to attend this important meeting! Please check pdf version of newsletter for full information about the schedule, reservations, and our proposed program and budget for 2017-2018. 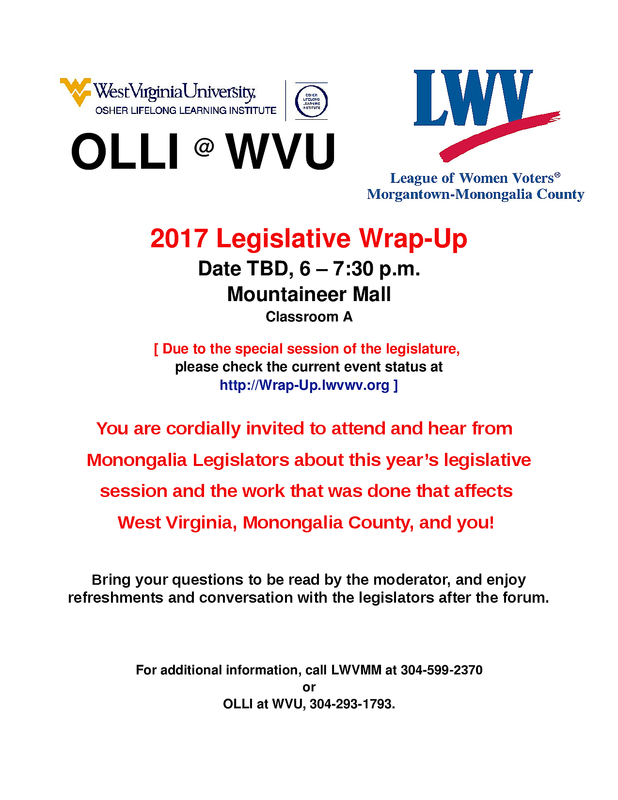 The League of Women Voters Morgantown-Monongalia County and Osher Lifelong Learning Institute at WVU will sponsor a Legislative Wrap-Up on a date to be announced. We have conducted these events in the past and find them very informative as they help community members understand the challenges that our Legislators face during a very grueling 60 days. Legislators will respond to a set of questions that will give them an opportunity to explain what they think went well, what they wanted but were unable to accomplish, and what things especially troubled them.. We plan to complete the wrap-up by 7:30. We will have a short time afterwards for refreshments and conversation. Please plan to attend this event! SOLAR HAPPY HOUR - Wednesday, May 24th 5:30-7:00pm at Mountain State Brewing Co.
Join WV SUN, the WV Sierra Club, the Morgantown Green Team, and the League of Women Voters to celebrate the success of the 2016 North Central Solar Co-op and the 2015 Morgantown Solar Co-op! We also welcome anyone who is interested in learning more about solar energy to join us at this event. Four members from Morgantown went to the State Convention in Parkersburg: Jonathan Rosenbaum and Shirley Rosenbaum as State Board Members, and Vicki Conner and Barbara Brown as Delegates. We are very excited that Jonathan is the new President of LWVWV, and Vicki Conner is a new director! Please plan to pay your dues when you come to the annual meeting May 20! Currently dues are $48 for an individual, $72 for a household (two at the same address), and $24 for a student. Checks should be made to LWV Morgantown-Mon County. (Dues and luncheon may be paid with one check). Congratulations to League members Bill Kawecki and Barry Wendell, and to all the other candidates. The new Council will be sworn in on July 1. The presentation will cover the economic history of West Virginia, its current economic status, why a state so rich in resources remains among the poorest in the nation, and what can bring greater prosperity to the state. Tuesday, May 16 at 7:00 p.m.